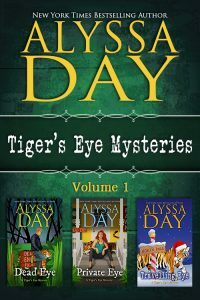 A shapeshifter heads home…and gets caught up in the mystery: Who shot Santa? When tiger shapeshifter and ex-rebel soldier Jack Shepherd learns about his uncle’s death, he fires up his Harley and heads across country to go home to Dead End, Florida. Along the way, a beautiful woman pulls him into a deadly mystery involving a missing Santa and a race to save two lives. But it’s Jack, and he never takes life seriously, so the laughs are flying as fast as the clues. Warning: This paranormal mystery series contains magic, shapeshifters, humor, banshees, magical ballerinas, GYSTers, a taxidermied alligator, smugglers, goats, thugs, assassins, witches, gunshots, bad singing, terrible parking, the FBI, swamp commandos, tigers, special agents, flirting, belly laughs, comedy, and a pawn shop. When will “Evil Eye” come out??? Waiting for more of the fabulous Jack! I’m hoping November for my birthday! I’m working on an omnibus. January in Atlantis is FREE right now! And if you’re talking about the previous set, email my assistant at [email protected] for a free review copy of Atlantis Rising. And thanks! So glad you liked Tiger’s Eye!